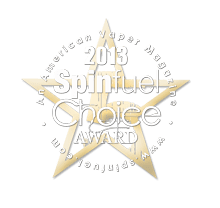 This review is a Spinfuel Team B Review – a Ginger’s eJuice Review, conducted in Concord New Hampshire – Ginger’s eJuice is the e-Liquid company that was responsible for finally moving the entire Spinfuel staff off of prefilled cartomizers and onto bigger and better vaping way back in early 2012. Had we not discovered just how much better eJuice could be when prepared by a real e-Liquid artisan, right here in the US, we would probably have stayed on cig-a-likes for several more months. So it is with a lot of pride, and respect for the artist behind the eJuice that we present the Ginger’s eJuice 2013 July is eJuice Month review. It has been a while, a long while, since we last reviewed a Ginger’s eJuice flavor. It hasn’t been because we didn’t want to, but rather because Ginger has been so incredibly busy with the many retail outlets that sell her juice, her wholesale side, and her European market, not to mention the whole e-Liquid creating, testing, mixing, bottling, shipping, and everything else it takes to run a large eJuice company. In a very short time Ginger’s eJuice has become a major player in the e-Liquid marketplace because her e-Liquids are like little masterpieces of flavor, vapor, and luxury. Without an innate ability to create some of the most flavorful e-Liquids on the market Ginger’s eJuice wouldn’t be the major player it is today. Whether the eJuice is being sold under the Ginger’s eJuice label or a European conglomerate’s name, every ounce of juice is made by the same hands and created by the same artist, Ginger herself. The Ginger’s eJuice brand is sold in retail locations up and down the east coast, and select spots out west as well. To top it off, all of this success comes in just a little more than a year. Can you imagine? Ginger’s eJuice is available is 12ML, 15ML, 30ML, and 60ML sizes (They offer several nicotine strengths as well, 0, 6, 11, 16, 24 and 36MG.) You can buy any flavor in plastic or amber glass bottles. The plastic bottles have a drip tip nozzle and the amber glass comes with a glass eyedropper. All of Ginger’s eJuice is based on 80% PG and 20% VG. For Vapers with allergies for Propylene Glycol Ginger’s eJuice “House Blend” may not be the best solution for you, but there is an excellent reason why Ginger has chosen to offer an 80/20 PG/VG ratio. As you can see, Ginger is very open about the ingredients used in the eJuice she creates. We’ve spoken to Ginger about Vapers that need something different than 80/20 PG/VG and she will accommodate them with specific blends, so if you are interested in any of the flavors we reviewed below but need a different ratio you can certainly ask. But, please keep in mind, our reviews are based on the “House Blend” at all times, with every brand we review, so if a flavor changes, or the throat hit or vapor ratings change for you because you opted for a different ratio, remember back to this paragraph. Lastly, before we get to the actual review, a word about steeping. You’ve probably seen in many of our reviews that certain brands require a home steeping (not all, but most) to bring out the optimum flavor, vapor, throat hit, but Ginger’s eJuice is steeped for a week before shipping out to you. No, that doesn’t mean that Ginger’s eJuice receives your order, mixes up the bottles, and then lets them sit for a week before shipping. Orders placed before 6PM are shipped the next day. Let’s just say that Ginger is the most organized person we’ve ever met, and the system is down to a science. Over the past year we’ve vaped eJuice from Ginger right out of the mailbox, and weeks later, with absolutely no discernible difference in flavor or performance. 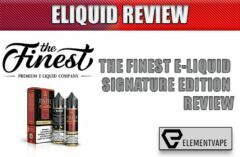 We allowed the e-Liquid vendors to choose the flavors they wanted us to review. Ginger submitted the following flavors, all 80/20 PG/VG and 16mg nicotine. The 72-hour review period was conducted in NH and Boston. The team was free to use whatever personal vaping hardware they chose to use. This included the ZMAX, and various tanks and cartomizers (Julia), JoyeTech eVic, and Halo Tritons (Keira), Halo G6 and Tritons (Jason), ProVari and SMOKTech DCTanks (Cynthia) and more Halo Tritons and the Triple 7 Bullet (Janet). Spinfuel Team B operates a bit differently than Team A, who are based in Florida. We meet and divide up the eJuice that is shipped up from HQ and then off we go into our separate worlds. Keira and I head back to Boston, the rest of the team stay in New Hampshire. After a 72-hour review time we meet and discuss our impressions over video Skype. The team members write up their impressions and email them to the lead writer, which is me (Julia), and then the narrative is constructed, emailed back to everyone for last minute changes or corrections, and then sent to Spinfuel HQ in Florida where it is once again read, edited (if needed) and then published. Keira: The way in which Ginger has been able to balance a great gingerbread flavor with the delicate Chai Tea flavor is simply amazing. This is a sweet, gingerbread-y flavor, but the Chai pulls back just a bit on the sweetness so that it isn’t even close to being a desert-type vape,it is instead an all-day vape. Gingerbread Chai has been added to my rotation of flavors immediately. Cynthia: This is my first gingerbread anything, and I’ve never desired a Chai Tea vape before. So I approached this flavor with caution. I knew how Jason felt about it by the way he jumped up and down when we opened the package, and I’ve heard good things from the Florida team from time to time. Janet: The thing I love most about gingerbread cookies is that gingerbread is kind of sweet, but not too sweet. The taste of gingerbread is very unique, so if I’m going to vape something that is supposed to taste like gingerbread it better taste like gingerbread. 1. Find a perfectly ripe white peach (not a regular peach… a white peach) at your local fruit stand at the peak of the season. 2. Hold it in your hands and admire its beauty. 3. Take several huge big bites of the beautifully ripe white peach, and quickly devour it. 4. Take a mental note of the urgent need to find the nearest napkin, to wipe all the juice off of your face. Julia: Juicy White Peach is also another one of John’s favorite flavors from Ginger’s eJuice. I don’t know why I’ve never had this before, other than maybe John kept it locked up. There are many flavors that are basic flavors to the e-Liquid artists, banana, peach, pineapple, coconut, and maybe a couple of others. I’ve had several different peach blends before and many of them are out-of-this-world awesome. Most are divided along the lines of being very sweet with peachy flavors, and very peachy with sweetness added in. Very few are ‘naturally sweet, authentic’ peach flavors. Juicy White Peach is that one; a normally sweet peach, but exquisitely peachy flavored. And if you’ve eaten as many white peaches as I have (K and I love to snack with fruit) then you know the difference in the taste. White peach, named after the meaty inside having a very light, almost white appearance, is not as sweet as a regular peach but the peach flavor is more intense. Somehow Ginger has created a real, authentic “white” peach vape that is more than a simple peach eJuice. Juicy White Peach doesn’t try to hide its peachy flavor with other flavorings; it isn’t at all complex in its makeup. It is simply the best tasting “peach” you can vape. Keira: Julia is exactly right about Juicy White Peach. It is the most honest version of a peach e-Liquid. I love all kinds of peach flavors, but like she said there are times when you just want to vape the best peach flavor you can get without the rest of the flavors fighting for dominance. Oh, I will continue to vape other peach flavors, because sometimes I want the sweetest peach vape I can find, but there’s just no way I’m not keeping a fresh bottle of this around for nights when I want to sit back with a real peach vape and enjoy the pure flavor of peach. Cynthia: You have to hand it to Ginger’s eJuice for taking the time that it takes to get the flavor just right. This Juicy White Peach is exactly what a ‘white peach’ tastes it. I expected something sweeter, like many of the other peach flavors sold today, and instead it was simply a ripe white peach vapor, and lots of vapor at that. Keira: I knew as soon as I took my first drag of Caramel Cappuccino that Jules was going to dislike it because it is wicked strong. It IS a strong coffee flavor with caramel tones, and its much too strong for occasional coffee drinkers or coffee drinkers that add a lot of cream to their morning cup o’ joe. Having said that, I drink my coffee black, so for me this was something very special. Cynthia: Whoa! Caramel Cappuccino is wicked strong! My boyfriend (boyfriend? He’s 44 – ed.) loves the heck out of this, but he’s not on the review team. Jules is right when she says it isn’t harsh like some coffee blends that will give you a tingling sensation in mouth when take a drag. Thankfully whatever coffee flavoring Ginger uses in this is so high quality that the strong flavor is present without taking any cheap shots at you. Janet: Caramel Cappuccino is, I think, a perfectly blended cappuccino with the right amount of dark coffee and the exact amount of caramel to add the right touch of sweetness. Caramel Cappuccino is a very good vapor producer though not as good as Gingerbread Chai or Juicy White Peach. Throat hit is powerful, but not so much that it’s unpleasant. I loved it, although I don’t think it can be an all-day vape unless you’re a Vaper like Tom McBride. Julia: Now we get to where a lot of Ginger’s eJuice reputation comes from: creating eJuice is that so satisfying that no matter what your likes and dislikes are, the are flavors in her lineup that will become your go-to flavors when you need a vape that will sate you like nothing else can. Keira: It took me a few months to learn that there are different “grades” of flavor concentrates that e-Liquid vendors can choose from. Some of them buy the least expensive ones they can find and some buy the most expensive they can find. The reason is that some brands want to create a “decent” e-Liquid that they make a lot of profit from and others who want to create the best tasting e-Liquids they can. It is obvious that Ginger’s eJuice is out to create the best tasting e-Liquids possible. Strawberry Shortcake is just another proof of that. Cynthia: Strawberry Shortcake has everything I love in an eJuice; real authentic flavors, vapor to beat the band, and a big throat hit that would satisfy the toughest critic. Who could vape this all day? Me, that’s who. I don’t know how she does it but these e-Liquids she submitted for review are simply outstanding. Real strawberry flavor, honest to goodness shortcake flavor, this is the finest strawberry shortcake eJuice I’ve had. This woman is a master artisan! Janet: After vaping Strawberry Shortcake for a while I started to feel bad about Vapers who have said they don’t like strawberries. If you honestly don’t like the taste of real strawberries you’re not going to like this one because it DOES taste exactly like fresh strawberries in luscious shortcake. If you DO like strawberries it is going to be impossible not to love this eJuice. I couldn’t get enough of it, and it did manage to eat into some of the time I had set aside for other flavors. I will add this to my daily vaping immediately. What’s really great about it; whenever you’re in the mood for a real strawberry shortcake and you don’t have one at home, you can load up a clearomizer or a cartomizer and vape this until you are completely satisfied. A real work of art this one, and one I won’t ever go without. Nobody knows this more than me; to award three Choice Awards out of four eLiquids submitted for review looks awful. Believe me, I worried about this a lot. But the plain honest truth is that none of us knows what the other person is awarding a certain flavor and when we discuss our impressions we are not allowed to tell anyone else what we scored it, so we can avoid undue influence. When the team members leave the Skype session and write up their impressions they email them to me, and in that email the scores are laid out. The number of “stars” that comes immediately after the narrative is their “gut” score, the breakdown scores, the “flavor, vapor…” scores under it are their judgment of each of the aspects of an eLiquid. The only one that counts toward the Spinfuel Choice Award is the one that follows the narrative, their gut score. When I printed them out and laid them on the dining room table my heart sunk for a brief moment. “This isn’t going to fly. We’re going to be called biased, I just know it.” So, one by one I called up each team member, well, except Keira, she lives with me, and I talked to them about the “gut” score. Each of them was adamant about it. They didn’t want to change their score. (I did not mention the reason for my call or that the others had voted the same way they did). Then I spoke with Keira and her opinion wouldn’t change. So, it was up to me. What would I do, faced with delivering three Choice Awards out of four eLiquids? Ultimately I decided to be completely open, honest, and transparent, as Spinfuel demands. I would admit my feeling in the review, as I am doing now, and I would honor our findings, no matter what it looked like. If Ginger’s eJuice earned these Choice Awards then she should have them. Well, she did earn them, and we are proudly awarding them for her excellence in creating such amazing eLiquids. Many of our readers have already tried, and loved, Ginger’s eJuice. We’ve given away dozens and dozens of bottles of her eLiquids and we’ve heard so many great things from our readers about Ginger’s eJuice. All four eLiquids were outstanding in flavor, vapor, throat hit, and the overall vaping satisfaction. How can they not be when the flavor is authentic and plentiful, the vapor production is abundant, thick, and flavorful, and the throat hits for every one of them are some of the best out there? These are four excellent choices, any way you look at them. The 12ML plastic bottle for $10, when compared against the 15ML amber glass for $3.00 more indicates to us that the better deal, by far, is to go for the 15ML amber glass (there is no plastic bottle for 15ML) $3 more. But, how long does a 15ML bottle last you? Each of us will vape, on average, 6ML a day, so a 15ML bottle would last a little more than 3 days, tops. We never buy 15ML bottles anymore, even when we buy flavors we’ve never tried. The value comes at 30ML and up. 30ML of Ginger’s eJuice is $22.00, a good savings over 15ML for $13.00. The 60ML size at $42 is a better value than the 30ML. But who wants to drop $42 or $43 dollars for 60ML of eJuice they’ve never tried? No one does, except people with money to burn. So what’s the right call for those of you that want to try Gingerbread Chai or Strawberry Shortcake, or the others? What’s the smart thing to do? If you’ve ever tried, and liked, a gingerbread eJuice then we can almost promise you that Gingerbread Chai is going to be one of your favorites. Go with a 30ML bottle. Same thing with the cappuccino, read what we have to say about them. Do you like strong, dark coffee eLiquids? If you do, Caramel Cappuccino will be among the best you’ve had. Like Strawberries? Same thing. What about peaches? Do you like peach eJuice? Then there is no way you’re not going to love Juicy White Peach. The 30ML bottle will allow you spend time with the flavors and not have to worry about getting another order placed in time so that you don’t run out. If you love the flavors as much as we did you won’t want to run out so quickly. On the other hand, if you vape 1 or 2ML a day then yeah, maybe the 12 or 15ML might be enough, but in our experience it never is. Whatever you decide I want to ask you to come back to this review and let us know what you thought about the eJuice flavors you’re tried. If you bought the “house blend” of 80/20 what did you think? This review will be read today, tomorrow, a year from now, and the more comments you make the more valuable it becomes to future readers. Finally, our history with Ginger’s eJuice goes back to the beginning of their company and ours. Our relationship is a special one, but don’t think for a minute that we wouldn’t tell you the truth about each and every eLiquid Ginger’s eJuice creates… we would, we will, we do. Our relationship is a special, like it is with a few others, for one reason, the eLiquids these companies create are wonderful. Julia Barnes, Keira Hartley, Jason Little, Cynthia Stevens, and Janet Richards…commonly known as Spinfuel, Team B.